The crust, made with just four simple ingredients, (mostly peanut butter and pretzels) provides a buttery, salty-sweet base for an incredibly rich dark chocolate ganache made with just two vegan ingredients: high quality dark chocolate and coconut milk! Despite its relative simplicity, every bite of this tart is perfection; salty, sweet, rich, luxurious & decadent. If you need any more convincing, my incredibly picky husband-to-be (Brent) had nothing but great things to say about this tart. He’s picky in the sense that his standards are way too high – if he had the choice, he’d probably eat at a Michelin star restaurant every night of the week. I keep telling him he’d be a great food critic; he’s also extremely well-written and thoughtful, so perhaps a career change is in his future. For now, you can find us sneaking slices of this tart from the fridge at all hours of the day. Remember a few weeks ago when I said I was going to try to eat less sugar in an effort to clear up my skin before the wedding? Lol. Good one, Lex. 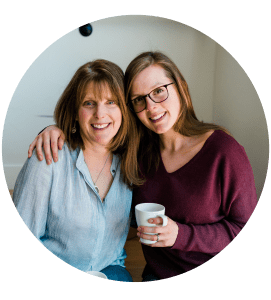 These are the times I have a bit of a love-hate relationship with food blogging. It’s literally my job to create delicious recipes, and the food isn’t going to eat itself. I really need to make some more friends in the immediate area so I can pawn off some of our extra desserts – any takers?! This rich, luxurious chocolate tart is surprisingly simple and requires just 6 ingredients for both crust and filling! Combine all crust ingredients in food processor. Blend about 15 seconds, or until a sticky crust forms and all pretzel pieces are broken up. Use a spatula to scrape down sides and blend once more. Press crust into an 11 / 1 1/8 inch nonstick tart pan (such as this) in an even layer. Use fingers to press crust around sides for an even edge. Place in refrigerator to harden slightly while you make the ganache. In a small saucepan over medium low heat, heat the entire can of full fat coconut milk. Whisk occasionally. Don’t let it come to a boil or simmer – just let it heat up. Use a sharp knife to chop dark chocolate into small shards. If using chocolate chips, you can skip this step. Add to a large mixing bowl. Pour hot coconut milk over chocolate and stir with a silicon spatula until chocolate is completely melted. You may have to stir for a minute or two to fully melt all of the chocolate bits. 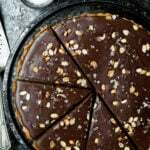 Pour chocolate ganache into cooled tart crust, smooth with a spatula and top with chopped peanuts and flaky sea salt (optional). Return to refrigerator for 2 hours or until ganache is hardened. Store any leftovers in refrigerator for 5-7 days. Enjoy! If you can’t get the chocolate fully melted with the hot coconut milk, use a double boiler to help heat it up more – just be sure to stir continuously.